LOCATION.--Lat 44°50'48", long 75°04'41" referenced to North American Datum of 1983, St. Lawrence County, NY, Hydrologic Unit 04150304, on right bank 15 ft downstream from bridge on County Highway 36 at Chase Mills, and 21 mi upstream from mouth. PERIOD OF RECORD.--October 2003 to current year. GAGE.--Water-stage recorder and crest-stage gage. 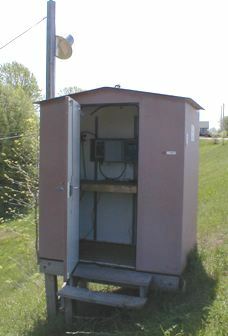 Datum of gage is 226.00 ft above NGVD of 1929 (revised) and 225.59 ft above NAVD of 1988. EXTREMES FOR PERIOD OF RECORD.--Maximum discharge, 11,400 ft³/s, Apr. 16, 2014, gage height, 7.73 ft; maximum gage height, 10.08 ft, Mar. 10, 2005 (ice jam); minimum discharge, 50 ft³/s, Sept. 8, 9, 2007, gage height, 3.90 ft.